If you are the kind of person that would find it unbelievable that something as interesting and compelling as finding a possible first edition of a 170-year-old book worth £30,000 could be summarily dismissed by not only one but two people simultaneously, then you probably haven’t met Oliver’s sisters. Daphne and Victoria Thompson, the twin red-headed apples of their mother’s eyes, were two of the reasons that Oliver didn’t come home for Christmas very often. It’s not that they were mean at all or purposefully inconsiderate, but they represented all of the things that Oliver had come to dislike about the holiday season. Their Christmas spirit was completely commercialized, consumed by consumerism, going so far as to revel in the way the season started before Halloween. They always asked you what you wanted for a gift, hounded you for the information, in fact, then decided that what you wanted wasn’t up to their standards and got you something completely different. Their standard, by the way, tended toward the ostentatious, which was nice on some levels, because if you weren’t going to get what you wanted, at least you were going to get something completely over the top and occasionally nice. There was a bit of quid-pro-quo with them, though — if they were going to go to the trouble of getting you something that they liked, you had better be sure to get them something that they liked in return. These thoughts passed through his mind as Oliver slowly followed his parents to the foyer, their investigations temporarily suspended if not forgotten. He cringed inwardly, realizing that he was going to disappoint his sisters at the least. His luggage had been lost somewhere between JFK and Heathrow, and all of the presents he’d procured were inside it. As inconvenient as this was for him, it would be practically devastating for Daphne and Victoria. Sidling into the foyer, Oliver saw that his parents were already taking bags and boxes from the twins. He tried to remain unnoticed, but unfortunately for him, his stealth was nothing compared to the twins’ perceptions. “Sure Vickie,” Oliver mumbled, stepping around the group and pulling on his coat. He almost, but not quite, stomped down the short walk to where Victoria’s car was parked. The setting of the sun was bringing on a rising chill in the air, although the breeze that accompanied it was still gentle. It might turn out to be a pleasantly cool evening, but the thought gave Oliver little comfort as he opened the driver’s side door. “Good to see you too Vickie. Yes, it has been a long time, hasn’t it? Aw, thanks! I don’t feel like I look fitter than ever…” Oliver mumbled to himself as he popped the boot open. There were two large containers full of more gifts than Oliver had purchased in his life, sum total. He hefted one container out, careful not to jostle its contents too much, and turned to take it back into the house. As he did, his eyes were assaulted by a garish combination of blinking lights of every shade on the spectrum. Victoria and Daphne must have seen to it that the exterior of the house was “properly decorated,” and the lights had turned on just as he was going back up the walk. He felt his eyes watering from both the burning of his retinas as well as the crushing of the last remnant of his Christmas spirit. 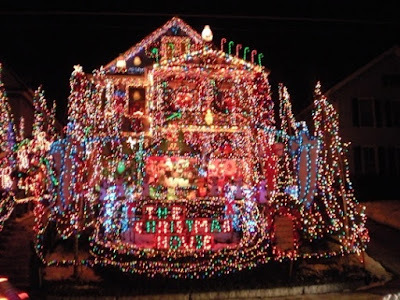 It was one thing to have a tasteful display of white lights outlining your house, but what Vickie and Daphne had done was… loathsome. Hunching his shoulders against the display, he re-entered the house. The foyer was empty at this point, everyone else having migrated to the living room to arrange the stuff that the twins had already brought in. Oliver put the container down on the foyer floor then repeated the trip to the car and back, shielding his eyes this time as he returned with the second container. He took the containers one at a time into the living room where everyone was already admiring the tree and presents. “Thanks, Ollie,” said Daphne, almost paying attention to him as she opened the containers and started pulling individually wrapped items out, transferring them to their proper places beneath the tree. Oliver noticed that his father has surreptitiously slipped away, probably finding his way back to the library to gawk at the book a bit more before dinner. “Oh Vickie, don’t start in on Oliver. His luggage was misplaced on his flight over here. All he has is what was in his backpack,” his mother said, seeming almost embarrassed at both the fact that she’d almost forgotten Oliver was there and that Oliver hadn’t managed to plan far enough ahead to have backup presents for just such an eventuality as lost luggage. “Oh, how interesting,” Daphne said, with a tone that conveyed Oh, who cares about some moldy old book you found in the back yard? Oliver suspected that she was finally realizing that she was not going to be receiving anything gift-wrapped from the USA on Christmas morning. “It’s Christmas, Ollie. We really want our last Christmas in this house to be a proper one. How are we going to manage that when you can’t participate in the joy of giving?” She said it so sincerely that for a moment Oliver almost believed that she was genuinely concerned with his well-being, and that he might feel badly if he couldn’t give gifts to everyone in the morning. “…well, not much, anyway…” said Victoria. She gave Oliver an extra squeeze as she said it, although he wasn’t sure if it was for jest or emphasis. Oliver didn’t trust himself to say anything, so he simply hugged them in return. After a few moments, the twins simultaneously broke the embrace, and Oliver found that he felt slightly better. Vickie looked slightly abashed, and Oliver took a small amount of sadistic pleasure in that fact. She dug through her purse for a moment, then handed her keys to Oliver. “For the records, Harrod’s is still open. But it’s a mad house. I wish you luck if you decide to stop by there,” she said, giving him a wink. It was hard to stay upset with the twins for very long. They had the rather annoying habit of doing something endearing just when you really wanted to dislike them. “Alright, I’d better get to it if I’m to have any chance at all. I’ll try to be back for dinner, but if I’m not, you go ahead without me.” A moment later, he was driving Victoria’s car through Soho towards Harrod’s. The best thing about Harrod’s is its diversity. In almost no time, Oliver had found two very elegant hand-crafted Faberge-style Christmas ornaments for Victoria and Daphne at one place and a book on lapidary art and methods for his mother at another. His father’s gift was the biggest challenge. He’d finally managed to find a Meerschaum pipe carved with the likeness of Buddha on the side in a small corner of the men’s section of a jeweler’s shop. Strangely, it had caught his ear before his eye as he’d walked by it. For a moment, he thought someone had called his name. When he glanced in that direction, he could have sworn he had seen the face of an old man on the pipe, and that the face had actually moved when he heard his name called. On his double-take, however, he recognized the Buddha image for what it was, and discounted the calling of his name as a trick from the combination of large amounts of ambient music, cash registers, and conversations. As he was finishing up the purchase of the pipe, he heard his name being called again. This time, he was certain it was someone purposefully trying to address him, and the voice itself sounded familiar as well. He turned around, searching for the source of the voice. Dottie laughed as she nodded vigorously at him. “Oh do come here, then,” she said, holding her arms open. Oliver warmly embraced her, and a flood of memories almost overwhelmed him. Dottie Keating was the woman he was madly in love with all through secondary school. They had tried dating in their final year, but had broken it off when her family had moved to Scarborough and she’d decided to go with them instead of staying in London to attend university. He’d tried to convince her that he could attend any university she was willing to go to, but she had refused to hear of it. Her mother was sick, and she needed to be able to focus on her and her father’s care. She had wanted to “remain friends,” but Oliver’s heart had broken too miserably to allow for that. It was one of the reasons he’d chosen to attend Yale in the United States — a fresh start with nothing to remind him of what might’ve been. “I’m sorry to hear about your Dad, Dottie. So, uh…” Oliver’s scattered thoughts were fighting for control of his language faculties. “Um, what new start happened for you?” he finally managed to get out. He was still smiling maniacally, but was also sweating slightly with the efforts of making cogent speech. “Great! I’d love to catch up a little more if you’ve got a chance. Can I get your number?” Dottie asked, although she didn’t make a move to get her cell phone out. “Yeah, of course. That’d be fantastic!” Oliver said, and meant it. He gave her his number, and she sent him a text message to confirm that she’d entered it correctly. “Alright, I don’t want to keep you. Please tell your family I said hello,” Dottie said, glancing at the time on her phone’s display. “And Oliver, I hope you have a very Merry Christmas.” She opened her arms again. Oliver didn’t remember Dottie being this big a hugger in school, but wasn’t objecting. Dottie laughed at that, saying “High tea? On a first date? Let’s try coffee first.” She released him and started walking towards another store. He walked in the opposite direction, toward the carpark. He couldn’t shake the surreality of the entire interaction. It stayed with him through the rest of the evening’s activities, including when he placed the gifts under the tree. It must have been the surreality that caused him to think, once again, that the Meerschaum pipe was calling his name as he left the living room and turned out the lights. I'm loving this years tale!